I'v decided I really should introduce myself and say hello as I've been lurking for a while and found this forum sooo helpful and interesting so thankyou for all your unknowing help and advice!! 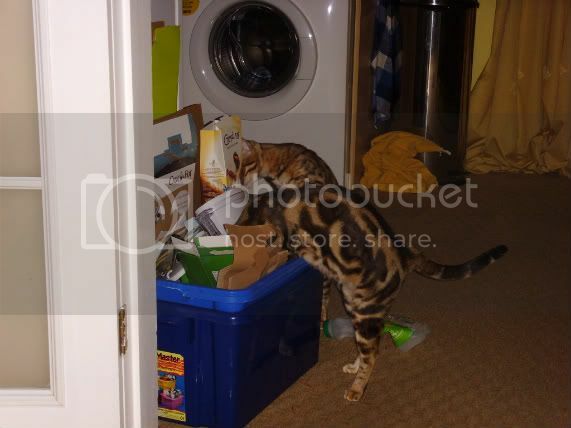 My name is Meg, and my boyfriend and I took the plunge in December to add two gorgeous Bengals to our new house and havn't looked back since! We are now slaves to retired queen Chloe (Owlsdene Lady Capulet), who is a brown marble and nearly 2, and her son Monty (Ambalee Montague), a spottie who is 5 months old today! They are our pride and joy and without a doubt turned our house into a home the minute they stepped out of their carrier. We are so grateful to Nicky of Ambalee for letting us have two such gorgous souls with the most fab personalities! Looking forward to sharing lots of stories on here with you all as this has to be the most friendly forum around (its the first one I've actually joined!). P.S Also hope the signature works as I've never made one before!! Hi and welcome to the forum. Your sig works fine. What a beautiful photo of two beautiful fur babies - I love the way they're framing the ornament so neatly It'll be great to see how Monty develops - I bet he'll be bigger than his mum very soon. I look forward to hearing more about their adventures. Also there is a great thread here called 12 fact tag, if you want to learn more about us on here and join in and tell us more about you?? Here is a link to it.. Welcome to the forum! Glad you stopped lurking. Beautiful cats! Ah thanks! 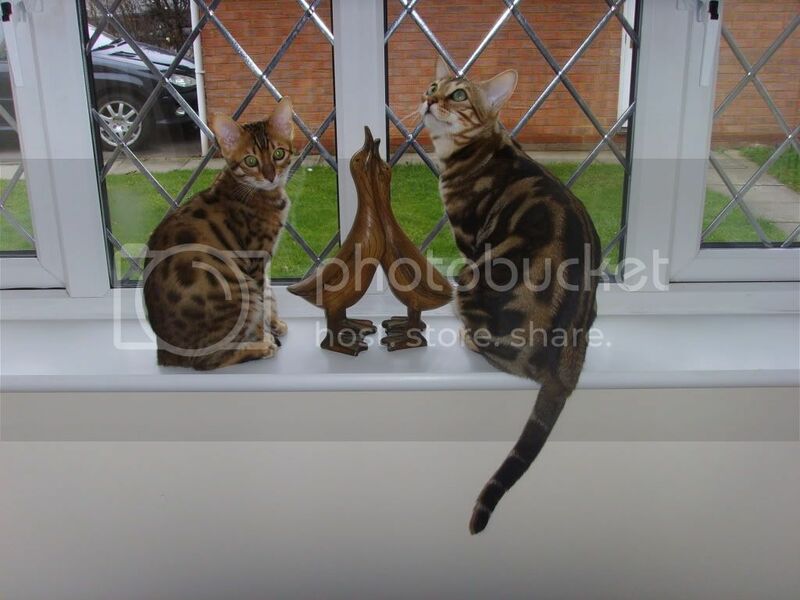 That photo was such a lucky shot for me, they were both chattering at birds out the window and happened to sit on either side of the ornament (purposely wooden and bengal proof-so far...!) , my camera was on the coffee table and I callled to them and they looked round! Even my boyfriend said it was a nice photo and he's normally very scathing about my photography skills (or lack of!). I know what you mean Ginny, I think Montys getting bigger every day and that photo was taken when he was just over 4 months old!! Luckily I dont think Chloe will let him boss her around, she's very much mummy cat around the house! Your Merlin is gorgeous, he looked to be a lovely big boy in a photo I spotted! Thanks Miki! We love Chloe's markings so much, funny as we both prefered the spotted ones when we first started to look but when we met Chloe we fell for her straight away, she's just so pretty and has a personality to match. You're cats are so gorgeous, I loved the photos of Rudy growing up, he's stunning! I'll definitely add my 12 facts, its only fair for you to know some random facts about me too!! Do I need to be tagged for it?! Thanks mollyrock and selina! obviously I think so but then I may be a little biased! Everyone's cats on here are so gorgeous though. Monty's being a little less than gorgeous at the moment though; he's trying to climb the banistairs but isn't quite making it so is leaping up the vertical supports, clinging to the top, and then sliding down like a fireman down a pole! Lol! He's better than tv! Hehe!! Your image made me chuckle! Seems very typical of bengals who seem to think they have 'supercat' powers like being able to fly.. Isn't Chloe a bit young to retire? I know my Monty's in full swing LOL!! Taz, Jasmin and Moshi, never forgotten, always loved.